Reprinted from Deadline Hollywood by David Robb on January 22, 2019. 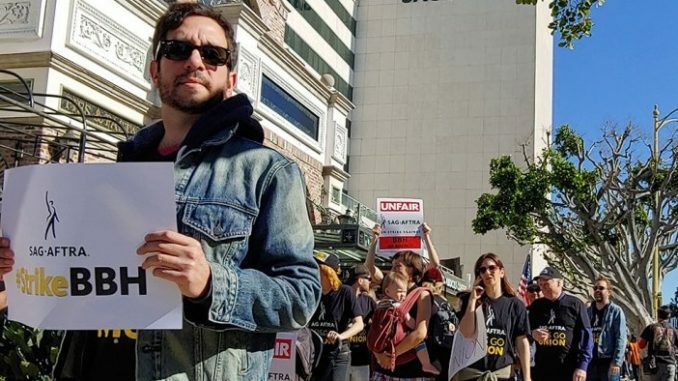 SAG-AFTRA members rallied Wednesday at the La Brea Tar Pits in a show of unity for the union’s four-month-old strike against Bartle Bogle Hegarty. Members met at the union’s headquarters in Los Angeles at noon and then marched to the nearby Tar Pits to hear speakers denounce the struck ad agency. Reprinted from The Hollywood Reporter by Jonathan Handel on January 23, 2019. The union says that move is legally impermissible, and as a result has been on strike against BBH since September 20.